Academic and private practice anesthesia differ. I’m fortunate to be a member of the clinical faculty in the Department of Anesthesia, Perioperative and Pain Medicine at Stanford University. Stanford is a unique academic hospital, staffed by both academic and private practice physicians. From 2001 until 2015, I served as the Deputy Chief of Anesthesia at Stanford, an elected officer who leads the private practice/community section of the anesthesia department. Stanford anesthesia residents frequently question me about how the world of private practice differs from academia. I began my writing career by penning a series of Stanford Deputy Chief Columns. These columns originated as a forum to educate residents using specific cases and situations I found unique to private practice. Although some anesthesia residents continue in academic medicine, most pursue careers in community or private practice. In 2009, the Anesthesia Quality Institute published Anesthesia in the United States 2009, a report that summarized data on our profession. There were 41,693 anesthesiologists in America at that time, and the demographics of practice type were: academic/teaching medical center 43%, community hospital 35%, city/county hospital 11%, and ambulatory surgery center 6%. Per this data, the majority of American anesthesiologists practice outside of teaching hospitals. 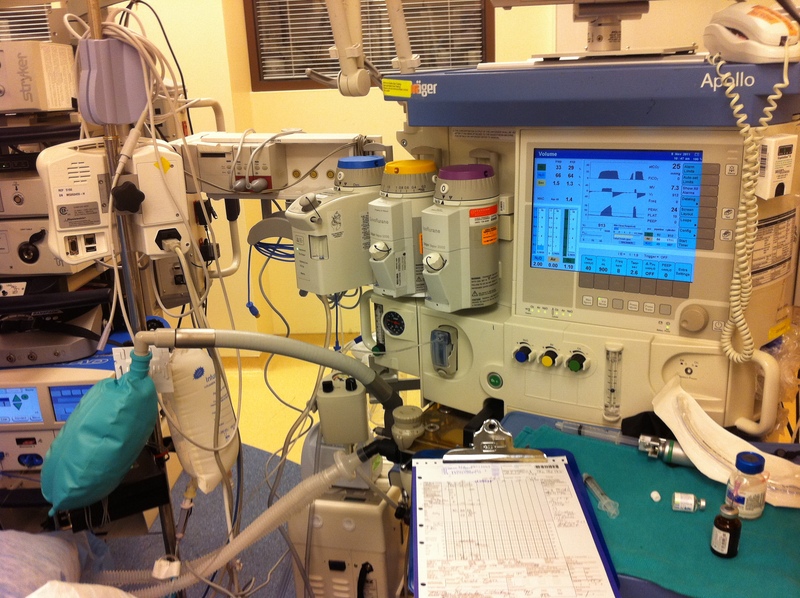 How does community anesthesia differ from academic anesthesia? I’m uniquely qualified to answer this question. I’ve worked at Stanford University Hospital for 34 years, including 5 years of residency training and one year as an Emergency Room faculty member, but my last 25 years at Stanford have been in private practice with the Associated Anesthesiologists Medical Group. You’ll work alone. In academic medicine, faculty members supervise residents. In private practice, you’re on your own. This is particularly true in the middle of the night or when you are working in a small freestanding surgery center where you are the only anesthesia professional. In these settings, you have little or no backup if clinical circumstances become dire. An additional example is the performance of pediatric inhalation inductions. During residency training, a faculty member starts the IV while the resident manages the airway. In private practice you’ll do both tasks yourself. I’d advise you to adopt a senior member of your new anesthesia group as a mentor, and to question him or her in an ongoing nature regarding the nuances of your new practice. (Note that certain private practices, especially in the Midwest or Southeastern U.S., utilize Anesthesia Care Teams, where anesthesiology attendings supervise nurse anesthetists, but this model is less common in California). Income: your income will be linked to your production. The good news is that you’ll earn more money that you did as a resident. Your income will be linked to the amount of cases you do. You’ll earn more in a twelve-hour day than you do in a four-hour day, so you have an incentive to do extra cases. A job where newly hired physicians have equitable access to workload is desirable. Income: your income will be linked to the insurance coverage of your patients. Privately insured patients pay more than Medicare and Medicaid patients. You may earn more working a four-hour day for insured patients than you earn working twelve hours working for the government plans of Medicare and Medicaid. It’s too early to know how much Obamacare and the Affordable Care Act will alter physician salaries. A job with a low percentage of Medicare and Medicaid work is desirable. Vacations. You’ll have access to more vacation time than you did in academic training. Most jobs allow a flexible amount of weeks away from clinical practice, but you will earn zero money during those weeks. It will be your choice: maximize free time or maximize income. Recipes. You’ll tend to use consistent anesthesia “recipes,” rather than trying to make every anesthetic unique, interesting or educational, as you may have done in an academic setting. Community practice demands high quality care with efficient inductions and wakeups, and rapid turnovers between cases. Once you discover your best method to do a particular case, you’ll stick to that method. Continuing Medical Education (CME). In an academic setting, educational conferences are frequent and accessible. After your training is finished, you’ll need to find your own CME. In California the requirement is 50 hours of CME every 2 years. Your options will include conventions, weekend meetings, and self-study at home programs. Many physicians find at-home programs require less investment in time, travel, and tuition than finding out-of-town lectures to attend. Malpractice insurance. You’ll pay your own malpractice insurance. As a result, you’ll be intensely interested in avoiding malpractice claims and adverse patient outcomes. You’ll become well versed in the standards of care in your anesthesia community. No teaching. No one will expect you to teach during community practice. You may choose to lecture nurses or your fellow medical staff, but it’s not required. No writing. No one will expect you to write or publish scholarly articles. You may choose to do so, but you will be in the minority. 10. Respect. You’ll experience a higher level of respect from nurses and staff at community hospitals and surgery centers than you receive during residency. Nurses and staff accept that you are fully trained and experienced, and treat you as such. Free food at lunch and breakfast is common. Some hospitals have comfortable physician lounges where medical staff members gather. Teams of physicians work together at the same community hospitals for decades, and form strong relationships with the nurses, techs, and their fellow medical staff. It feels terrific to collaborate with the same professionals week after week. Academic training is an essential building block in every physician’s career. If and when you choose to venture beyond academia into community anesthesia, this column gives you some idea what to expect. I recommend you find a mentor to help you adjust to the challenges of your new practice setting, and I wish you good luck with the transition. Posted in CLINICAL CASES FOR ANESTHESIA PROFESSIONALS.Tagged Academic and private practice anesthesia differ., academic anesthesia, ambulatory anesthesia, Anesthesia, anesthesia blog, anesthesiologist, anesthesiologist income, anesthesiologist working alone, anesthesiologists, anesthesiology, CME in anesthesia, Private Practice Anesthesia, RIchard Novak MD, RIck Novak MD, the real world of anesthesia.